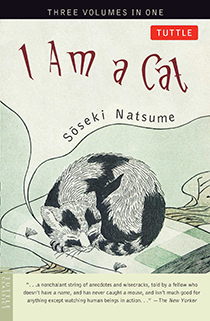 This post is about I Am a Cat, a series of semi-related stories published serially in 1905 and 1906 that provide a satirical look at Meiji-era Japan through the eyes of a smug young housecat. Either eminent Japanese novelist Sōseki Natsume (1867 – 1916), also known for his novels Kokoro and Botchan, was prescient for choosing an uppity lolcat as his narrator, or that special attitude cats have has always been apt to make us laugh. See below to find out what you need to know to decide whether you should read I Am a Cat, or what you should know about it even if you never do! What is the cat like? Let him tell you in his own words. Satire, it seems, can straightforwardly convey serious observations alongside absurdities such as this one, in which the unnamed cat, attempting to pray to his stubby tail, goes from unselfconsciously pompous to unselfconsciously ridiculous. In telling us tales of himself and the cats and humans around him, the cat deploys an astonishing range of fancy words such as ‘infundibular’, ‘micturition’ and ‘afflatus’. The narration achieves a humorous effect when the cat uses a wide variety of (usually mocking) descriptive phrases for things rather than repeating the same word. For example, he calls his master’s facial smallpox scars pockmarks, craters, pits, pot-holes, sunkennesses, disastrous dimples and eternal dents. Who are the other characters in I Am a Cat? During the course of the stories, we encounter a tough, crude cat (Rickshaw Blacky), a lady cat (Tortoiseshell), a family of rich neighbours (the Goldfields), and some baseball-playing students from the next-door school, among others, but the central characters are the cat, his master and his master’s friends. Sneaze, the cat’s master and a teacher. Purportedly a caricature of the author, Sneaze is the prototypical absent-minded professor: perpetually somewhat short of money, old-fashioned, awkward and even naïve, often dyspeptic and sometimes irritable. He is married to a balding woman and has several children whom he mostly ignores. Waverhouse, a show-off. He invites himself into other people’s houses, tells lies for fun and chatters constantly, to the impatience, befuddlement or amusement of those around him. Beauchamp, a poet. He describes what he sees as the role of the modern poet as writing by direct inspiration, without responsibility for analysis or interpretation, or even meaning. Coldmoon, a scientist and former student of Sneaze. A good-looking young man, he falls in love with Opula Goldfield and feels envious when Beauchamp tells him he has written a book of poems dedicated to her. Suzuki, a former classmate of Sneaze. Suzuki, now a well-to-do, Westernised employee of Mr Goldfield, is called in by Mrs Goldfield (called ‘Madam Conk’ by the cat because of her large nose) to assist in investigating Coldmoon as a possible husband for their daughter Opula. Singleman, a professor. He is a zen practitioner with a goatee who spouts abstractions and quotations. He plays a game of go with Waverhouse, who seems more interested in talking. If you want to read the original short story that sparked the serial work and serves as its first chapter, you can read an old, non-copyrighted translation of it (and the second chapter, in fact) for free online here. It was translated by Yasotarō Mōri, who also completed a translation of Natsume’s novel Botchan. To get a sense of the other chapters, you can read summaries provided by a blogger named Scott. The English version I read (seemingly the only one in print) was translated from Japanese by Aiko Ito and Graeme Wilson in three separate volumes published in 1972, 1979 and 1986. Tuttle published the combined edition in 2002. There’s an out-of-print translation by Katsue Shibata and Motonari Kai and an old, rare edition from 1906 translated by K. Ando revised by K. Natsume. Also note that two Japanese-language movies have been made based on the book, one in 1936 and one in 1975. There is also a 1982 Japanese cartoon. I would like to see that!